Disney Parks announced today the opening seasons for the highly-anticipated Star Wars Land known as Star Wars: Galaxy's Edge, at both Walt Disney Land Resort in Orlando, Florida and Disneyland Resort in Anaheim, California. Fans on the West Coast will be the first to experience Galaxy's Edge, with the Disneyland park opening in the summer of 2019, with the Walt Disney World park opening in the fall of 2019. Both of these attractions will be open before the final installment of the current Star Wars trilogy is released, Star Wars 9, which is slated to hit theaters on December 20, 2019. Disney Parks has also released a brief video, which shows the doors of a ship opening to reveal Galaxy's Edge from a distance, with an image quite similar to the previously-released concept art of the Star Wars land. The Galaxy's Edge experience will be set on a brand new Star Wars planet named Batuu, which was described as a planet on the Outer Rim that used to be a popular spot along trade routes, but it became less and less prevalent due to the advent of hyperspace travel. Now Batuu is a popular home for those who live outside the law, such as smugglers and adventurers, and also a refuge for those trying to avoid the First Order. It was also revealed in March that Batuu will be featured in an upcoming Star Wars book, Timothy Zahn's Thrawn: Alliances, which will be published on July 26, a follow-up to last year's Thrawn. An excerpt of the book was released that reveals that Batuu is where Thrawn had previously, and unwittingly, interfered in one of Palpatine's plans long ago. Another book excerpt indicated that Darth Vader had a connection to this planet as well, with Palpatine sending both Vader and Thrawn to Batuu to investigate this "disturbance" in The Force. Whether or not the events of this book will tie into the plans for Galaxy's Edge remains to be seen. There had previously been rumors that Disneyland would again be the host city for Star Wars Celebration in 2019, timed to the opening of Galaxy's Edge, but that was recently proved false, when it was revealed that Chicago will play host to Star Wars Celebration next year. Next year's Celebration will take place April 11-15, 2019 at McCormick Place in Chicago, and since this will likely take place before Galaxy's Edge opens at Disneyland, it's likely that there will be a new sneak peek at Galaxy's Edge during next year's Star Wars Celebration. Unfortunately, Disney hasn't revealed any exact dates for the debut of Galaxy's Edge at either resort, but that announcement may be coming soon. 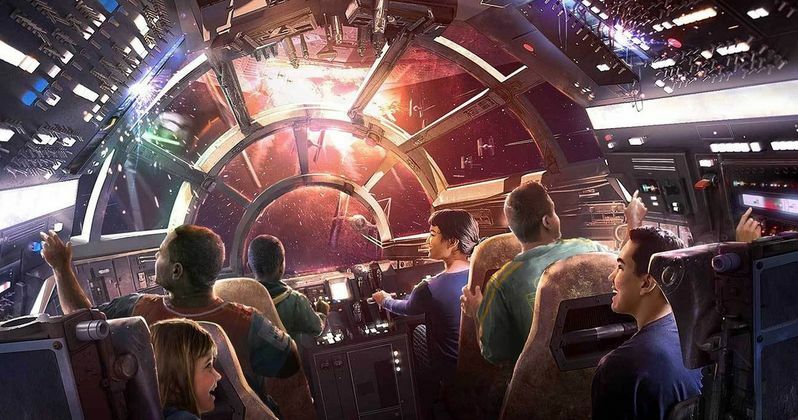 Among the attractions at Galaxy's Edge will be a Millennium Falcon ride, where guests will pilot the Falcon on a secret mission, and another ride where visitors will experience what it's like to be on a massive Star Destroyer. Familiar characters like BB-8 and Chewbacca will be featured at Galaxy's Edge, along with Rex, the pilot from Star Tours, who is now a DJ at a real cantina, where fans can try concoctions like blue milk and much more. Take a look at this brief video below, courtesy of https://disneyparks.disney.go.com/blog/2018/05/opening-season-just-announced-for-star-wars-galaxys-edge/|Disney Parks Blog, and stay tuned for more on Star Wars: Galaxy's Edge.